Major Asian markets continued to slide last Friday due to the political impasse in the U.S. debt deal as well as investors' wariness concerning debt problems in the Eurozone. In line with the cautious sentiment, FBM KLCI lost 3.1 points to 1548.8, dragged down by MISC (-29 sen to RM7.45), MAYBANK (-7 sen to RM8.76), CIMB (-4 sen to RM8.27), YTLPOWR (-6 sen to RM1.96) and GENM (-5 sen to RM3.65). On a wow and mom basis, the KLCI fell 1% and 1.9% respectively. The Dow futures and the Dollar index rose this morning, in the wake of positive newsflow that lawmakers and President Barack Obama are close to an agreement to raise the federal debt limit and avoid a default before 2 Aug. The positive newsflow is likely to bring cheers and relief rallies to regional markets and Bursa Malaysia today. 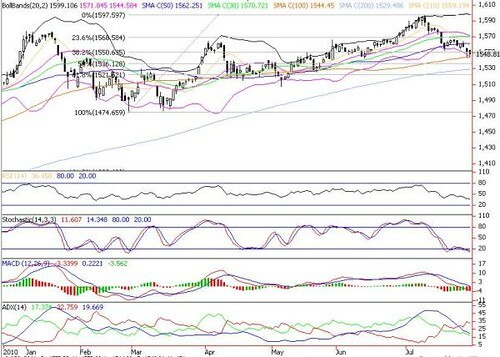 On Bursa Malaysia, the hammer formation candlesticks over the last two sessions could be a positive reversal signal as it appears that the index is trying to form a base near the 100-d SMA. If prices can hold above this level for the next few days, there is a good chance that it may charge towards upside resistance at 1559 (10-d SMA), 1562 (50-d SMA) and 1571 (30-d SMA). However, if the 100-d SMA is broken, selling pressures will intensify and index will head towards 1536 (50% FR) and 1529 (200-d SMA) zones.